Previous studies have investigated the prevalence of dental caries and oral hygiene status among MH children in comparison with healthy children. ,, Few studies have associated various sociodemographic variables and clinical variables with the oral health status of MH children. , However, there is a paucity of literature exploring complex relationships between dental neglect and dental caries and its consequence among MH children. Hence, a study was designed with the objectives to assess the prevalence and severity of untreated dental caries and explore the relationship between untreated dental caries and dental neglect among MH children and healthy children in Bangalore city. A cross-sectional comparative study was conducted in 6-17 years old MH and healthy children in Bangalore city, Karnataka (India) during May-July 2014. The study was approved by the Institutional Ethics Committee and required permissions were obtained from the Administrators and Principals of schools. Informed consent was obtained from the parents prior to the study. The parental version of DNS was considered for measuring dental neglect. The questionnaire was translated to Kannada (local language) and cultural validation of DNS was performed by means of back-translation method. Further, it was assessed for readability and comprehension among 30 parents. Inclusion criteria for MH children were those who are diagnosed as MH (based on records) and children without mental disorders for healthy children. Excluded were those who exhibited altered behavior, could not cooperate, having other detrimental systemic disorders, conditions that make assessment of dental status difficult. A total of 160 in each group participated in this study. The sample was drawn from school children aged 6-17 years, attending special schools and government schools. Children were examined at their school premises, seated on a comfortable chair, under natural light. The data collection instrument composed of two parts: A structured questionnaire administered to the parents and a clinical oral examination of the children. The questionnaire had two sections: Sociodemographics and DNS. Sociodemographics included data about children's age, gender, socioeconomic status according to Kuppuswamy scale,  oral hygiene practices and use of dental services. Dental neglect scale consists of 7 items with questions on two domains: Avoidance and negligence. Answers were recorded using a Likert scale rated on a five-point scale. The higher the score the greater the dental neglect. Caries experience was evaluated using decayed, missing, and filled teeth (dmft)/DMFT index  and consequence of dental caries using pufa/PUFA index (Pulpal involvement [p/P], Ulceration [u/U], Fistula [f/F], Abscess [a/A])  by a single examiner who was trained in the Department of Public Health Dentistry by a senior faculty. Infection control and sterilization measures were observed throughout the study. Sufficient sets of autoclaved instruments were taken for the day-to-day examination. Subsequent to dental examination, teachers/parents were educated about the oral health status of the participants and were referred to seek required dental treatment. The statistical program SPSS version 18 (IBM Corporation, SPSS Inc., Chicago, IL, USA) was used for data management and analysis. Descriptive statistics were used to summarize numeric and qualitative data. Only those who have completed the questionnaire were included in the analysis (130 among MH group and 152 among healthy group). Frequency for each domain of DNS questionnaire was calculated after giving weightage for each option considering positive and negative question (5 = strongly agree to 1 = strongly disagree). For negative questions, this weightage was reversed. Final analysis included merging of positive and negative responses for each question. The prevalence of PUFA/pufa was calculated as percentage of the population with a PUFA/pufa score of one or more. The "untreated caries, PUFA ratio" was calculated as PUFA + pufa/D + d × 100. Statistical tests such as Mann-Whitney U-test, Chi-square test, Spearmans correlations, and step-wise linear regression were used. A P < 0.05 was considered as significant. A total of 130 MH and 152 healthy children formed the study groups. Majority of study subjects in MH group had mental retardation 66 (50.8%) followed by Down's syndrome (21 [16.2%]), Autism (19 [14.6%]), and 12 (9.2%) with cerebral palsy and attention deficit hyperactive disorder each. [Table 1] outlines the sociodemographic characteristics of the study groups. MH group comprised a higher percentage of males than females while in healthy children genders were almost equally distributed. The mean age of MH and healthy children were 11.65 ± 3.70 years and 11.51 ± 3.54 years, respectively and the difference was not statistically significant. Most of the children in both the group belonged to middle and low socioeconomic status with the education of parents being high school level. Mothers were mostly home-makers and fathers were unskilled workers in both the groups. A higher proportion of MH children (121 [93.1%]) and healthy children (148 [97.4%]) were using a toothbrush for cleaning the teeth. Around 126 (96.9%) of MH children and 144 (94.7%) healthy children were using toothpaste. Majority of MH (121 [93.1%]) and healthy (148 [97.4%]) children were brushing once a day. Higher proportion of MH children (90 [69.2%]) visited a dentist when compared to healthy children 88 (57.9%). Pain was least mentioned reason among MH children (01 [0.01%]) when compared to healthy children (38 [43.18%]). [Table 2] presents caries experience and its consequences. Majority of the study subjects in both the groups had experienced caries (dmft + DMFT) and most of the lesions had progressed to odontogenic infections (pufa + PUFA) resulting in high PUFA Ratio. However, the difference was not statistically significant. Furthermore, the component u/U was not found in both groups. [Table 3] shows the responses of the parents to DNS. Around two-third of MH children's parents responded negatively while 2/3 rd of parents of healthy children responded positively for home dental care. Regarding receiving oral care, there was almost equal distribution of the response of parents in both the groups for all three major categories (yes, uncertain, and no). Most of the parents in both the groups responded positively that their child needs dental care but they put it off. Higher proportion of parents in MH group, when compared to healthy group, responded positively that their child needs dental care but their child puts it off. Self-care practice was lower in MH group (39.2%) when compared to healthy group (76.3%). Similar proportion of responses was observed between the groups regarding the child controlling between meal snacking as required. Lower proportion of parents in MH group, when compared to healthy group, responded positively that their child considers dental health to be important. However, the statistically significant difference was found for the item no 1, 4, 5, and 7 in DNS (P = 0.001). In both the groups, the strong statistical correlation was seen between dmft and pufa, while the moderate correlation between DMFT and PUFA (P = 0.001) [Table 4]. The coefficient of determination (R2 ) after adjustment (adjusted R2 ) is shown in [Table 5]. Mental condition along with age accounted for maximum variance while other variables added minimally to this variance. Dental neglect in children and adults is associated with a number of negative outcomes in oral health and overall functioning. When manifested in behaviors and/or attitudes related to the undervaluing of oral health, it has been found to be a predictor of poor oral health, leading to increased oral functional limitations and social and physical disabilities. Dental neglect is an entity measurable by the DNS and has been shown to be associated with a wide range of dental clinical and behavioral indicators. Exploration of parental perception about children's dental health is important as these perceptions can directly influence the preventive dental care the children receive at home and their use of professional dental services. Hence, parental version of DNS was used since the study included children with intellectual disability. Majority of the children in both the groups used toothbrush and toothpaste and were brushing once a day. Jain et al. reported the use of toothbrush in 58.7% in their study while in Purohit et al. study all participants were using toothpaste. It is observed that children of the low socioeconomic strata tend to have substantially more untreated caries than higher strata. In the present study, most of the subjects in both groups belonged to lower middle class and upper lower class. Majority had high experience of dental caries and its consequences although more than 50% visited the dentist for check-ups in last 1 year. The caries experience of MH are consistent with some studies , but greater than other studies , published in the literature. Caries experience reported among healthy children in the present study is in line with few studies , but higher than reported by Murthy et al. study. There was no significant difference between the groups for caries experience. This is similar to study by Ivancic Jokic et al. However, two studies , have reported the significant difference. On the other hand, a systematic review on adults has concluded that caries rates in people with intellectual disability are the same as or lower than the general population. The difference in caries prevalence in various studies could be due to different age group, different population composition involved. Furthermore, there is cross-cultural variation in perceptions of health and disease since people share different values with respect to health. Besides, older studies of caries in MH children used institutionalized populations whose diets were restricted. These groups may not have had the exposure to cariogenic foods at the rate of today's children who are growing up at home. Pulpal involvement was a predominant component in both the groups. As codes "f" and "a" refer to the same inflammatory process of the jaw, the necessity to score these codes separately may be questioned. Furthermore, treatment indication will be same both the codes. As recommended in other studies , it is therefore suggested that these codes could be grouped into one. The component u/U was not observed in both groups which is consistent with few studies. , The almost complete absence of code "u" obtained in our study is another argument to question the necessity of integrating code "u" into an index. The "untreated caries PUFA ratio" for MH was 54.8% indicating that 54.8% of the D + d component had progressed to an odontogenic infection. In healthy children it was 48.9%, which is in line with previous studies , and higher when compared to other studies. ,, This reflects one in every two children had one or more clinical consequences of untreated dentine carious lesions, which would demand extraction or endodontic treatment. High scores regarding pufa can be probably due to the absence of preventive care which, together with other caries risk factors, results in a rapid progression of caries lesions up to pulpal involvement and further complications. Poor oral hygiene in disabled children has been attributed to less ability to understand instructions, low power of concentration, lack of motor skills, innate skills, and manual coordination. These traits are reflected in this study with the majority of the MH children's parents responded negatively when compared to parents of healthy children for the question on child maintaining his/her home dental care. For the question "Your child needs dental care; but he/she put it off?" Every 3 out of 4 MH children were avoiding dental care need when compared to 2 out of 4 in healthy children. The parents have rated positively for this question that indicates their child puts off dental visits. In reality, MH children may not be in a position to decide for themselves or allowed to decide. Hence, in this background the response is questionable whereas healthy children may be in a position to express their need about dental problems. Regarding "Your child brushes as well as he/she should?" the perception about positive self-care practice was lower in MH group (39.2%) when compared to healthy group (76.3%). This might be due to lack of manual dexterity and intellectual ability in MH children. This reflects awareness among parents about oral hygiene practices. In this study, only 1 out of 5 children in MH children group when compared to 1 out of 2 in the healthy group considered his/her dental health to be important. The parental/caregiver response were similar in both the groups for few items with spreading of the response across the choices available indicating a lack of consensus for a given item. The strong correlation between the caries experience and clinical consequences of untreated caries in deciduous dentition compared to moderate correlation in permanent dentition is suggestive of increased risk of occurrence and rate of progression of active caries to pulpal infection in deciduous dentition. Non-significant correlation was seen between DNS, dmft/DMFT, and pufa/PUFA in both the groups. Multiple regressions were employed to analyze the association of various sociodemographic variables with caries. The variance caused by variables were type of clinical condition (0.002), age (0.464), gender (0.003), socioeconomic status (0.002), frequency of brushing (0.008), no variance caused by DNS. Overall this model explained a variance of 47%. The coefficient of determination (R2 ) after adjustment (adjusted R2 ) gives us some idea of how well our model generalizes and ideally its value should be the same; or very close to; the value of R2 . In this analysis, the difference for the final model was 0.480-0.467 = 0.013 or 1.3% which elucidate that if the model was derived from the population rather than a sample it would account for approximately 1.3% less variance in the outcome. To our knowledge, this is the first study on MH children assessing the consequence of dental caries and its relation with DNS. However, the study has inherent limitations. First, it is difficult to establish a casual association in a cross-sectional design. MH group consisted of varying proportion of conditions that may have masked the phenomena of interest (association/difference). The DNS used in present study suffer from similar weakness as other Likert Scale such as social desirability bias (tendency of respondents to answer questions in a manner that will be viewed favorably by others), central tendency bias (respondents try to avoid extreme statements), and acquiescence bias (tend to agree with the presented statements). Parental perception version was used as a proxy to DNS. Hence, it may not have reflected children's true attitude and behavior toward oral health. Besides parental perception cannot be considered as a typical self-rated scale. On the clinical arena, pufa/PUFA index lacks differentiation between the teeth classified for pulpal treatment or extraction due to an extensive destruction of the tooth crown as both clinical situations are diagnosed with the pulpal involvement (p/P) code. Despite the limitations, this study offers a relevant perspective for the public health and scientific community to further explore this area of interest. Oral health has a significant impact on holistic health. Oral health promotion and intervention programs should be targeted toward high-risk groups like MH. Special oral health programs to motivate and educate the children and their guardians should be carried out at regular intervals. Parents/caregivers should be counseled regarding the importance of self-care, professional care, oral hygiene practices, and diet. Pediatricians and primary health caregivers should be oriented about early detection of dental conditions and prompt referral. Further studies are suggested using longitudinal study design, having large sample size, giving due representation to a group of heterogeneous conditions with respect to their disability and oral health manifestations. No relationship was found between untreated dental caries and dental neglect. Solanki J, Gupta S, Arya A. Dental caries and periodontal status of mentally handicapped institutilized children. J Clin Diagn Res 2014;8:ZC25-7. World Health Organization. Prevention and promotion in mental health. France: WHO; 2002. Kaur S, Malhotra R, Kaur H, Battu VS, Kaur A. Oral hygiene status of mentally and physically challenged individuals living in a specialized institution in Mohali, India. Indian J Oral Sci 2013;4:17-22. Anders PL, Davis EL. Oral health of patients with intellectual disabilities: A systematic review. Spec Care Dentist 2010;30:110-7. Purohit BM, Singh A. Oral health status of 12-year-old children with disabilities and controls in Southern India. WHO South East Asia J Public Health 2012;1:330-8. Murthy AK, Pramila M, Ranganath S. Prevalence of clinical consequences of untreated dental caries and its relation to dental fear among 12-15-year-old schoolchildren in Bangalore city, India. Eur Arch Paediatr Dent 2014;15:45-9. Monse B, Heinrich-Weltzien R, Benzian H, Holmgren C, van Palenstein Helderman W. PUFA - An index of clinical consequences of untreated dental caries. Community Dent Oral Epidemiol 2010;38:77-82. Thomson WM, Spencer AJ, Gaughwin A. Testing a child dental neglect scale in South Australia. Community Dent Oral Epidemiol 1996;24:351-6. Coolidge T, Heima M, Johnson EK, Weinstein P. The Dental Neglect Scale in adolescents. BMC Oral Health 2009;9:2. Jaber MA. Oral health condition and treatment needs of a group of UAE children with Down syndrome. Ibnosina J Med Biomed Sci 2010;2:62-71. Jain M, Mathur A, Sawla L, Choudhary G, Kabra K, Duraiswamy P, et al. 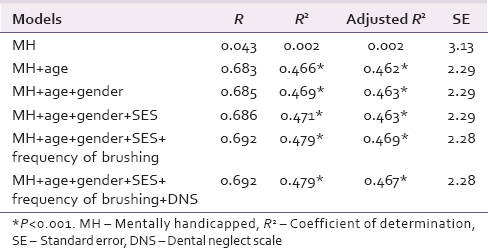 Oral health status of mentally disabled subjects in India. J Oral Sci 2009;51:333-40. Directorate of Welfare of Disabled and Senior Citizens; Welfare of Disabled. Available from: https://www.karnataka.gov.in/welfareof disabled/Pages/schemes_edu.aspx. [Last accessed on 2014 May 03]. Bruhat Bengaluru Mahanagara Palike. Available from: http://www.vigeyegpms.in/bbmp/?module=viewslide and action=bbmpschools#2. [Last accessed on 2014 May 03]. Suresh K, Chandrashekara S. Sample size estimation and power analysis for clinical research studies. J Hum Reprod Sci 2012;5:7-13. Patro BK, Jeyashree K, Gupta PK. Kuppuswamy's socioeconomic status scale 2010 - The need for periodic revision. Indian J Pediatr 2012;79:395-6. World Health Organization. Oral Health Surveys. Basic Methods. 4 th ed. Geneva: WHO; 1997. Altun C, Guven G, Akgun OM, Akkurt MD, Basak F, Akbulut E. Oral health status of disabled individuals attending special schools. Eur J Dent 2010;4:361-6. Bhambal A, Jain M, Saxena S, Kothari S. Oral health preventive protocol for mentally disabled subjects - A review. J Adv Dent Res. 2011;2:21-26. Benzian H, Monse B, Heinrich-Weltzien R, Hobdell M, Mulder J, van Palenstein Helderman W. Untreated severe dental decay: A neglected determinant of low Body Mass Index in 12-year-old Filipino children. BMC Public Health 2011;11:558. Jamieson LM, Thomson M. Dental health, dental neglect, and use of services in an adult Dunedin population sample. N Z Dent J 2002;98:4-8. Farid H, Khan FR, Aman N. Knowledge, attitude and practice of mothers regarding their own and children's dental health - A tertiary care hospital based study. J Ayub Med Coll Abbottabad 2013;25:35-7. Kitchens DH. The economics of pit and fissure sealants in preventive dentistry: A review. J Contemp Dent Pract 2005;6:95-103. Saravanakumar MS, Vasanthakumari A, Bharathan R. Oral health status of special health care needs children attending a day care centre in Chennai. Int J Stud Res 2013;3:12-5. Asokan S, Muthu MS, Sivakumar N. Dental caries prevalence and treatment needs of Down syndrome children in Chennai, India. Indian J Dent Res 2008;19:224-9. Census of India 2011. New Delhi: Registrar General and Census Commissioner of India; 2011. Available from: http://www.censusindia.gov.in/Census_And_You/disabled_population.aspx. [Last accessed on 2014 Aug 12]. Timiº T, Dãnilã I. Socioeconomic status and oral health. J Prev Med 2005;13:116-21. Bagiñska J. Evaluation of the status of primary dentition in 6-7-year-old children from Bialystok district using the mean dmf and the index of clinical consequences of untreated caries. Dent Med Probl 2013;50:160-6. Figueiredo MJ, de Amorim RG, Leal SC, Mulder J, Frencken JE. Prevalence and severity of clinical consequences of untreated dentine carious lesions in children from a deprived area of Brazil. Caries Res 2011;45:435-42. Shanbhog R, Godhi BS, Nandlal B, Kumar SS, Raju V, Rashmi S. Clinical consequences of untreated dental caries evaluated using PUFA index in orphanage children from India. J Int Oral Health 2013;5:1-9.